Here is how this story begins. It starts a few weeks before my birthday when I blogged about how the only thing I wanted for my birthday was to be pregnant. To feel the joy and excitement of a positive pregnancy test. The day after my birthday, I got what I prayed for. I found out I was pregnant! Joe and I were soooo thrilled! At around 31/2 weeks I began spotting. "Here we go again" I thought. I immediately lost all hope and happiness for the pregnancy and decided I was going to become distant with it. I was not going to allow myself to love this baby until I was 100% positive it would be a viable little baby. I wanted to hear the healthy heartbeat before becoming emotionally attached. As the weeks went on the spotting continued. I just kept thinking why me? Why would God do this to me again?! I called my OB who sent me for blood work a few times. The first set of hCG levels that I got were taken at just shy of 4 weeks. My levels were in the 300s and my progesterone was 33. That is fantastic for progesterone btw. My next set were taken 3 days later and they were 859, more than double which is great! I became nervous when the following week at 5 weeks 4 days I started spotting red and was again asked to go get blood work done. I received the results almost immediately. My levels came back at 22,750! I thought "holy hell, this is a molar pregnancy." 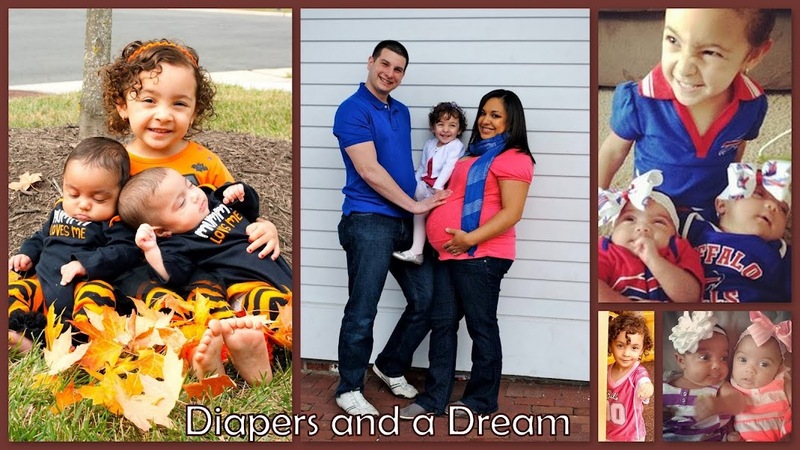 If you followed my story from a few months ago, I had a molar pregnancy scare. They thought my blighted ovum was actually a mass of cells that just multiply out of control in the gestational sac. They tend to take over almost like cancer. It was terrifying. I asked the nurse if she thought that was too high and she said no and scheduled me for an ultrasound the next day. 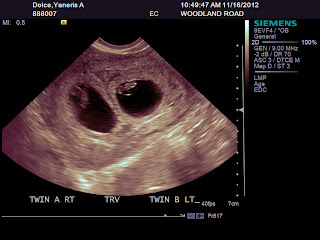 I woke up the morning of my ultrasound with a sickening feeling. I thought for sure I was miscarrying. I was spotting still and told Joe not to expect any good news at all. He, of course, was very optimistic telling me that he had a very good feeling about this time around. As I begin to drive, I realize I had not eaten lunch. If I don't eat when I am pregnant my blood sugar takes a nose dive and I get nauseas, I begin to shake and I get dizzy! Add to that my nerves and you have got a dangerous situation. We pulled over to the nearest gas station and got some potato chips and a diet coke. Within minutes of scarfing it down I felt much better and we had arrived to my appointment. I was told to undress from the waist down. My knees were shaking and I thought for sure I would pass out on the exam table. 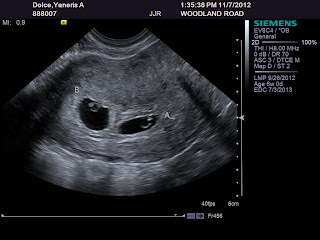 I caught a glimpse of the baby and saw a flickering bright spot, it was the heartbeat that I have been hoping to see! Joe has a huge smile on his face. I almost cry. Well, the tech then flashes to a gray screen and under #of embryos she writes "2." I looked at Joe to see if he noticed but I just assume that must be some sort of code. I look back at the screen and the tech starts to say, "well I wanted to be sure of this before I show you. You, my dear, are expecting twins." WHAT?? There they were, two little sacs with their perfectly formed little beings. Their little yolk sacs providing nutrients and their little hearts beating strongly at 5 weeks 5 days. Baby A measured 5 weeks 6 days and baby B measured 5 weeks 4 days. Both of their heartbeats were in the 100s. My own heart was racing as well. Today we saw the little twinkies (appropriate since today Hostess went belly up lol) and their hearts were beating strongly at 154 and 139 BPMs. All I can do is laugh. And cry. This is one of the happiest moments in my life. It reminds me so much of the happiness I felt when we saw Adrianna for the first time in the ultrasound with her little heart beating so strongly. She is going to love being a big sister, twice! My heart just grew that much bigger and made room for my little babies. BTW, we never even got to begin our consult with the RE that was going to help us conceive. This was all natural BAY-BAY! !